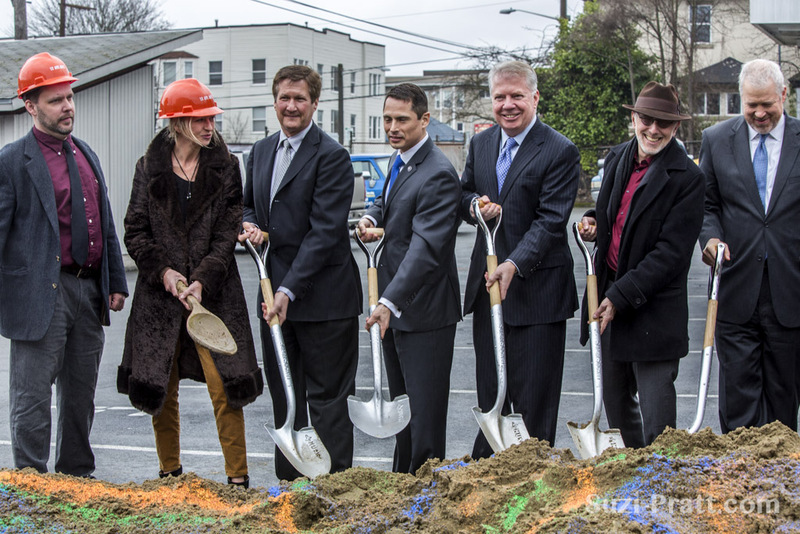 UPDATE — 6:00 PM: In an empty parking lot readied for the environmental preparations ahead of the start of construction, dignitaries turned the ceremonial first shovels of dirt for the 12th Ave Arts project. Details of the Capitol Hill Housing-developed mixed-use facility and affordable housing project are below. 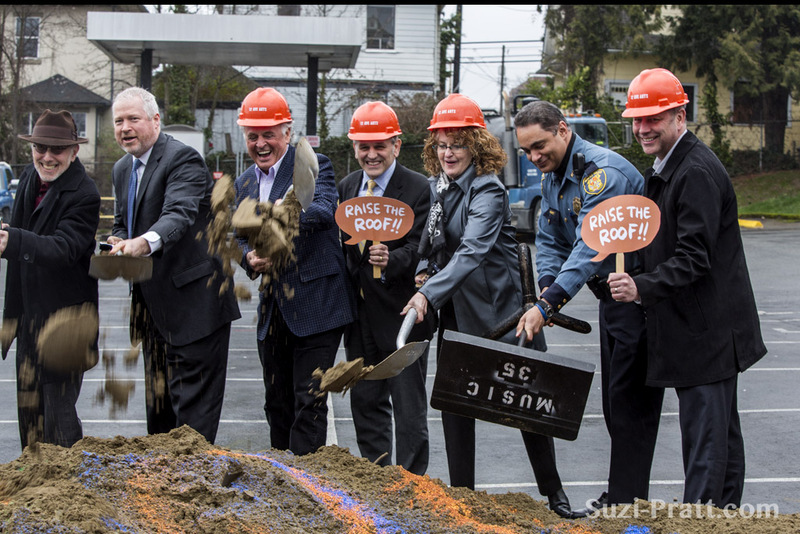 “The City is proud to partner with Capitol Hill Housing and the many community organizations involved in the 12th Avenue Arts project to turn a parking lot into a neighborhood hub for artists and residents,” said Mayor Mike McGinn before digging into the dirt pile with Deputy Seattle Police Chief Nick Metz, Senator and candidate for Seattle mayor Ed Murray, Uriel Ybarra from Senator Patty Murray’s office, City Council member Nick Licata, Randy Robinson of KeyBank, Linda Derschang of Linda’s, Smith, etc. and Michael Malone of Hunters Capital. “Most of the businesses that were opening in the early to mid 90’s were started by folks who were attracted by low rent and the convenient location between Broadway and downtown,” said Derschang in her brief speech before the groundbreaking. A Capitol Hill Housing representative said work is underway to start the transformation of the former East Precinct parking lot beginning with the effort to empty and prepare the fuel tanks present on the property for removal. Construction is expected to take 18 months. 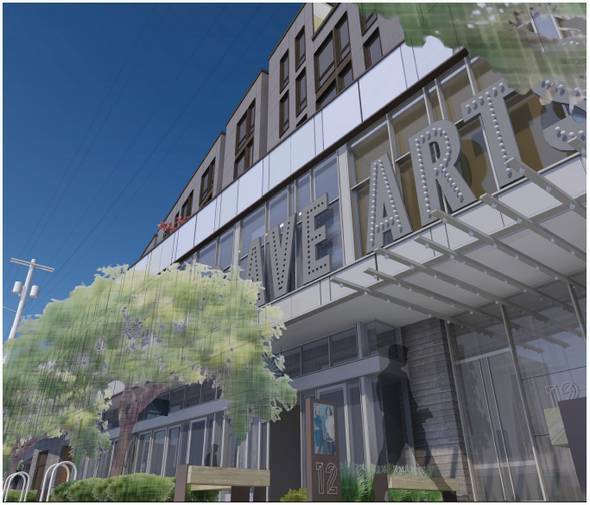 Original Report: Thursday brings a celebration of a one-of-a-kind Capitol Hill development project pairing space for the arts with affordable housing. All while making room for the police department to park its vehicles and creating a new home for the building’s non-profit developer. 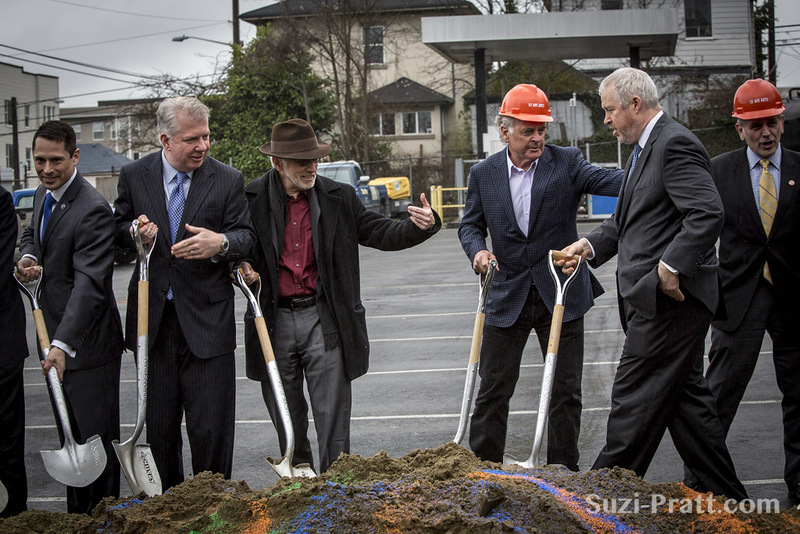 Capitol Hill Housing’s12th Ave Arts building breaks ground Thursday afternoon with a ceremony including dignitaries, music and some free chow. Event will also feature live music by Bucharest Drinking Team; wood-fired pizza from Via Tribunali and their mobile pizza oven; and coffee courtesy of Caffe Vita. CHS will have more coverage and pictures from the groundbreaking. With theater groups already lined up to manage the performance space, the six-story project has a 2014 opening target. The Washington Ensemble Theatre will be joined by Strawberry Theatre Works and New Century Theatre Company as tenants in the new building. 12th Ave is already home to the Velocity Dance Center and the Northwest Film Forum. The new 29,000 square-foot building will include 88 apartments, office space, parking for the Seattle Police Department’s East Precinct, and 6,000 square feet of theater space described as a “149-seat raked theater with fixed sets, and an 80-seat flexible black box space.” It will also include commercial and restaurant space. No business tenants have yet been announced. We asked groundbreaking dignitary Linda Derschang if she plans to be part of the project — no plans right now, she said. The architect on the project is SMR Architects, creator of the plans for CHH’s Pantages Apartments on E Denny Way. 17,000sf of office space (Level 2) — much of the retail space will be occupied by Capitol Hill Housing, the remainder will be leased to mission driven organizations. As for who is going to live in the 88 new apartments when they’re ready in 2014, there are two tracks. For those who qualify, CHH operates on a first come, first served basis. The available units will be listed via capitolhillhousing.org and Craigslist when they are ready for leasing. You can sign up for the CHH mailing list to stay on top of things. Meanwhile, a push to raise a final $750,000 from the community to add to the $3.8 million already raised through grants and larger gifts to support the project is underway. Half of the $4.6 million goal came thanks to big cash from the Paul G. Allen Family Foundation, the Joshua Green Foundation, and the Wyncote Foundation. The project also received $565,000 from Washington Building for the Arts. You can learn more at 12avearts.org. Capitol Hill Housing is using a mix of tax credits, levy dollars, state programs and commercial bank loans to complete the $38 million project and is receiving a $7.7 million loan from the city to help create the development. An agreement for transferring the property from the city to the nonprofit developer was pounded out earlier this year. Capitol Hill Housing is already lining up its next big project as it prepares a plan to build affordable housing at 23rd and Union and will also be busy working with Vulcan in the development of Yesler Terrace. Meanwhile, the nonprofit developer opened its new apartment building The Jefferson at 12th Ave late last year. 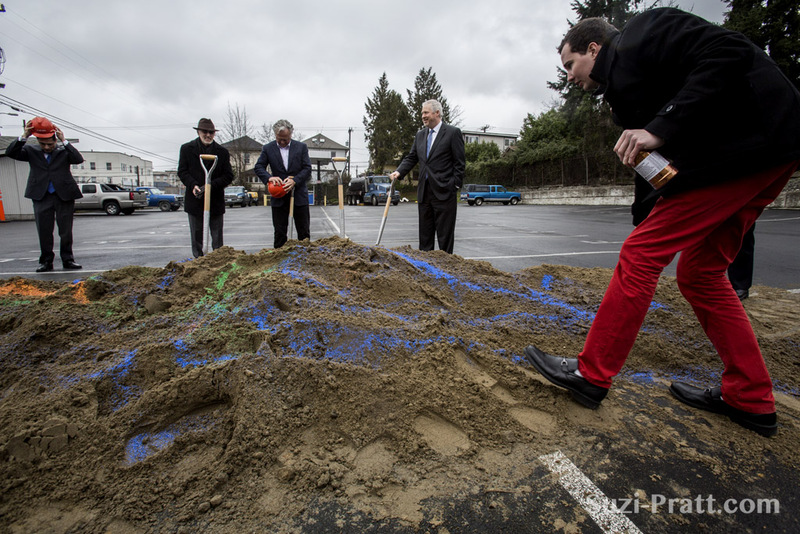 The project is the result of a two-decade push from community groups and organizations to create something greater with the East Precinct parking lot. One major sticking point had been the parking infrastructure and concerns over the cost and the number of spaces the project would need to provide. 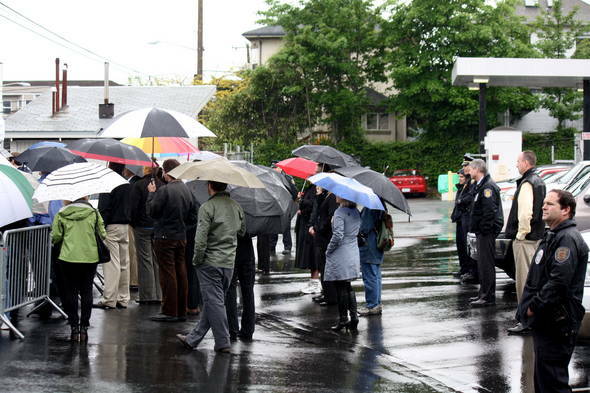 The East Precinct parked 70 cars on the 12th Ave lot and another 30 on a private lot at 14th and Pine. The project was delayed in recent years due to debate over the number of parking spaces that could be made financially feasible in the development. SPD has said it needs around 150 spaces in any development. 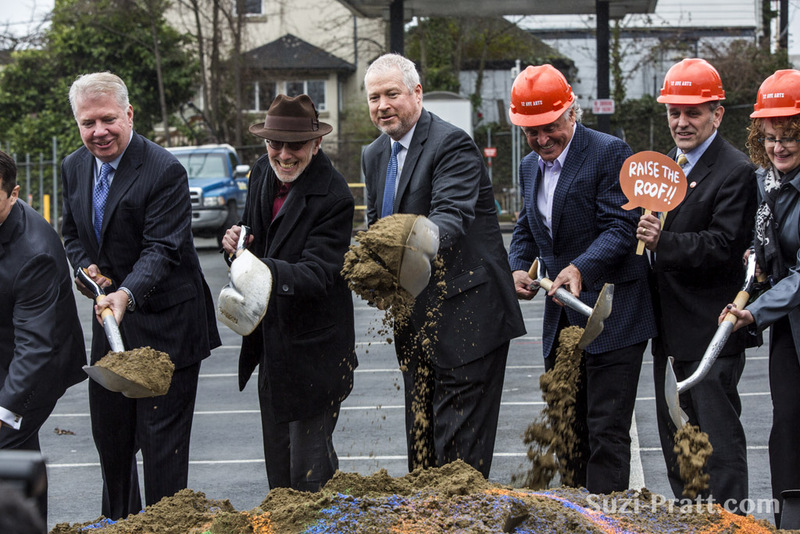 For Capitol Hill Housing, the groundbreaking has importance beyond the ability to develop yet another affordable housing project in the neighborhood. With the planned demolition of the Davis Hoffman building CHH had called home, Thursday’s groundbreaking also means progress toward the construction of a new home for the non-profit developer. 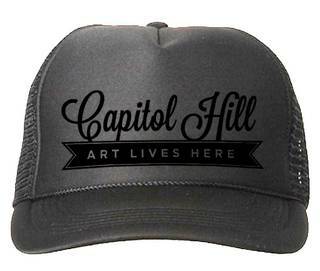 Congratulations Capitol Hill and thank you CHH for this amazing project! Many years in the making, and under construction.